What is the best way to ensure employees and teams succeed? Some executives and managers praise, encourage, let people work at their own pace and time, let them work in their own ways, and from time to time make gentle suggestions for improvement. Others say this is “soft,” “touchy-feely”. They direct people firmly, or ride them, or tell them exactly what to do, or chastise or punish errors or falling behind, or compare people unfavorably with colleagues, or use favoritism as carrot-and-stick. Some use do these without realizing it. Is the first approach soft? Do any of the second ones work? What we now know about the brain tells us about both approaches. The brain is hard-wired to turn off creativity and intuition if the brain senses danger of any kind. The brain decides what danger is; we don’t decide. Scientific studies show that a firm, chastising, criticizing management style signals danger. A hint of disapproval turns off most of the brain. Only a small sliver still thinks. That sliver can only function in a tight box of linear thoughts (a àbàc). It’s not very productive. The same studies show the first method is highly effective. Praise, encouragement, freedom to work how one wishes, and gentle suggestions motivate success and do it well. They turn on nerve cells and circuits in the brain that inspire individuals and teams to do their best. Increasing these five traits increases productivity by increasing comfort, creativity, and intuition. Going against any one of the traits, just one, shuts down effectiveness and productivity. They shut down in a fraction of a second; it takes hard work over a long time to get them back. Status in Rock’s term means social status, intellectual status; or a personal sense of honor and worth within a group, a department, an organization, or a company. Certainty means knowing from moment to moment how an action will influence efforts. The efforts may be to get a effect one wants or they may be to avoid errors. Certainty is a subconscious state of the brain when planning or carrying out complex tasks. Autonomy means freely choosing between possibilities. Autonomy gives a person or a group the sense they are in control of what they are doing. Relatedness means feeling part of a group of friends. Lack of relatedness is what someone feels when s/he has to face an enemy or believes they are outsiders instead of members of a clique. Fairness means feeling that authorities treat you just as they treat others: no prejudices, no insiders, no favoritism. All of us like these traits. Your reports like these traits and know when the traits are gone. You as a report or subordinate feel these traits and their absence. You as a manager probably don’t feel them, whether you use them or avoid them. A manager who is abrupt or uses a carrot-and-stick may not intend to undercut the SCARF traits. S/he may not recognize s/he is undercutting anything. What counts is how the reports feel. How reports feel determines their effectiveness and productivity. What is going on in the brain? Most of the brain deals with subconscious actions and with reflexes. A critical part of the brain is the nerve cells and connections that trigger reflexes to get us out of danger. They make sure we avoid enemies or threats. This is survival. It is a basic need. The need to survive is much stronger than its opposite gratification. Gratification is wanting to be with people we love and things we love, wanting to stay with a supportive group, enjoying what we are doing, getting rewards. The reflexes in the brain that support survival are much stronger than the reflexes that underlie gratification. Fig. 2. Lobes of brain and their functions. Frontal lobe: controlling movements (motor and pre-motor strips); motor output of language, higher intellectual or executive functions, including “pre-frontal cortex”. Parietal lobe: sensations from skin, joints, tendons, much of body. Occipital lobe: various aspects of vision. Temporal lobe: hearing, balance, (nearby: taste), putting together and interpreting language; interpreting vision; memory, emotions, sense of smell. The parts of the brain that deal with survival are small, on the front surface of the brain and low down on the front sides. They are nerve cells in the ¼-inch-thin outer layer or cortex. The area is what deals with linear, logical thinking. It’s called the “pre-frontal cortex” (see Figure 3). Fig. 3. Mesial (middle) surface of brain, cut from back to front, top to bottom, and looked at from the middle surface. 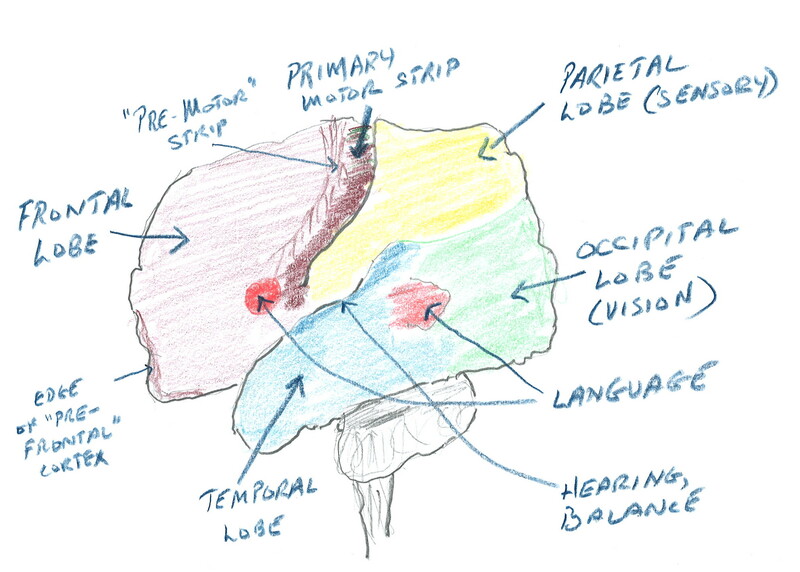 The visible priotions of teh major lobes are marked, as is the cerebellum (balance, smoothness of movement, repetitive movements) the midbrain including the pons, and the hind-brain of medulla. Grey matter is tinted light blue. White matter (pathways of axons) is tinted orange. The pre-frontal cortex is tinted brown. 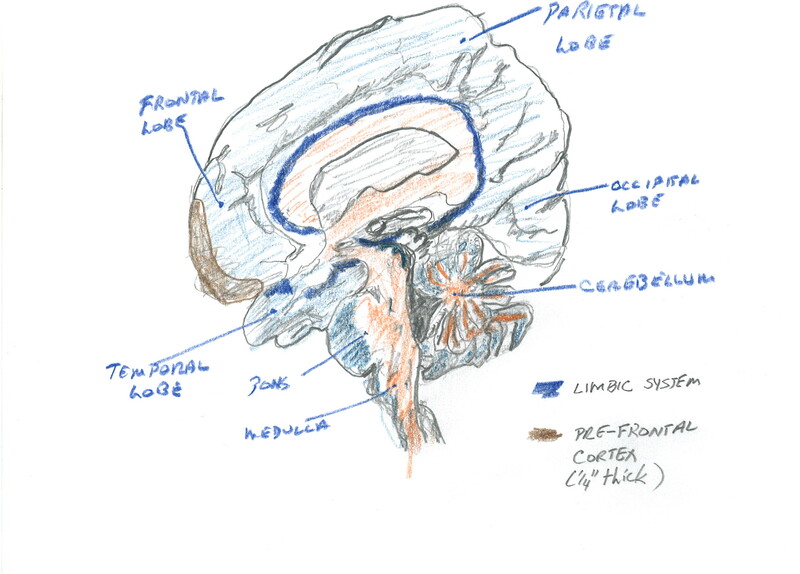 The limbic system (see text) is tinted dark blue. Reflexes act and work in a few thousands of a second. The subconscious brain treats anything that threatens a SCARF trait as a danger or a threat. Danger threatens survival. Our need to survive is much stronger than our wish to be gratified. Threats of all kinds signal a nucleus, a collection of nerve cells, deep in the brain on each side called the amygdala (see Figures 4, 5, and 6). Fig. 4. Drawing to show the deep nuclei of the brain in relation to the outer surface of the hemisphere. Thalamus largely handles sensory input. Putamen and caudate handle preparation for movement and setting up proximal muscle movements(like the upper arms and trunk) to support the movement of the more distal muscles (like movers of the fingers) The amygdala is laregly concnerned with recognizing danger and foes. When the amygdala perceive a threat, they act instantly to put the rest of the brain into “fight-or-flight” mode. Emotions switch to fear and anger (temporal lobe, see Figures 1, 2, 3, and 6). Bad memories come up, memories of fearful events and things that made us angry (hippocampus, Figure 6). Part of the brain signals disgust and nausea (the insula, see Figure 6). The intuitive functions of the brain shut down. 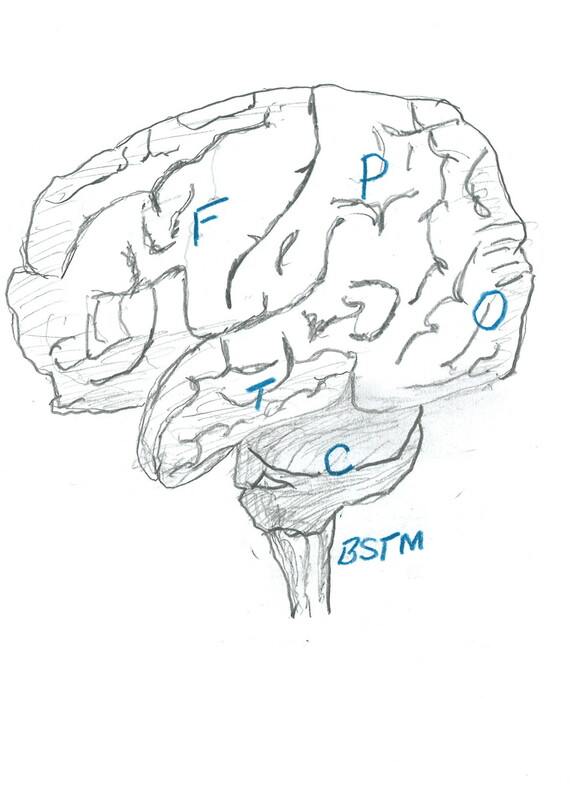 The only thinking part of the brain that is active is the prefrontal cortex (see Figure 3). This thin layer works only with learned, linear, logical behaviors; nothing else. All of this together is the survival mode. Fig. 5 shows the strucutres in relation to the hemispheres. Fig. 6 shows the structures with teh hemispheres removed. You can’t avoid the survival mode. When we are trying to survive we cannot deal with non-linear problems. We cannot be creative. We cannot think out of the box. We cannot be kind to others, we cannot work out new ways of doing things, and we cannot use intuition. Survival is every man for himself, every woman for herself. Teamwork and social abilities disappear. The “slice” would be perpendicular to the groove between the hemispheres, towards the front half of the temporal lobe. 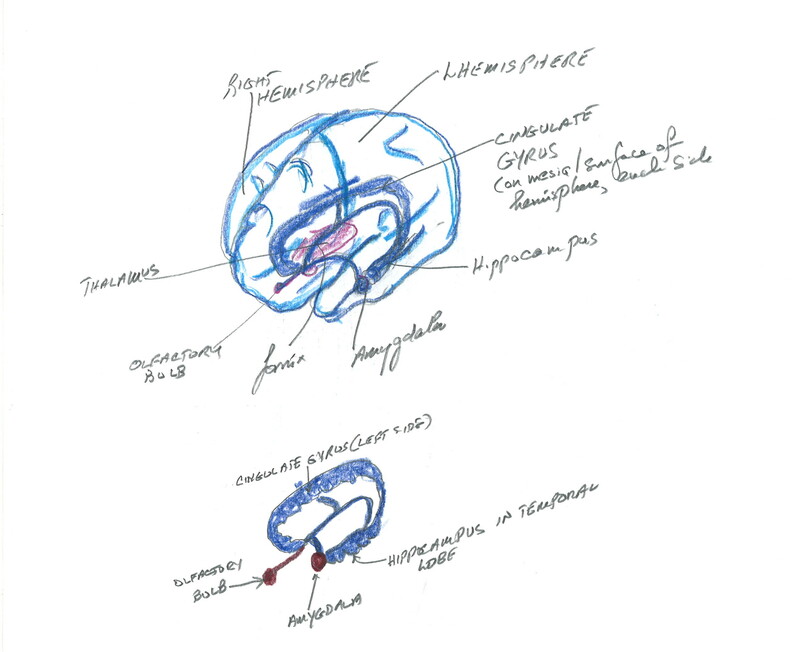 Purple-blue is grey matter (cortex, various nuclei). Orange is white matter (axons connecting one area of the brain with another). The temporal lobes are the lower bulges on either side. The frontal lobes are the bulges above. The white inverted triangle in the middle is the two lateral ventricles (full of spinal fluid) covered by the (orange) connection between the two hemispheres (corpus callosum). 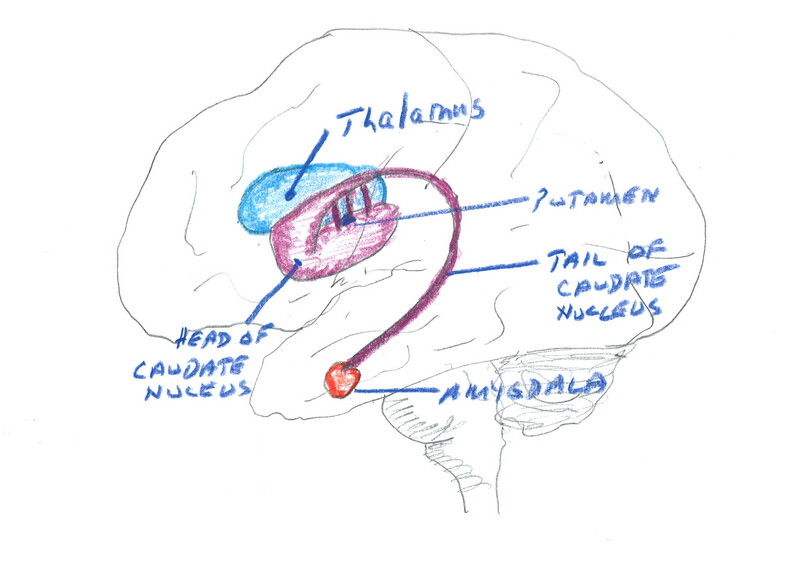 The area of the cingulate gyrus and the area of the amygdala are labelled. So is the insula, the cortical region involved with the sense of taste and with disgust and nausea. Managers and executives beware: the more often people perceive threats to survival at their workplace, the worse the consequences. Behavior gets worse. Efficiency and productivity go down. It takes longer and longer to restore people’s brains to a neutral state, let alone an aligned, creative state. And yes, simply working the wrong way with reports and teams about their work in your organization is interpreted by the brain as survival, not as simply being told to work a certain way! Aren’t there exceptions — firefighters, soldiers, emergency room doctors and nurses — people trained to deal with emergencies and disasters? These highly-trained people are actually hyper-focused in the survival mode of their expertise. In this mode, they use linear logic instead of creativity. They are not exceptions. They’ve just been trained in many specific linear processes the rest of us don’t know. I only know one protection from automatic fight-or-flight. It is to get trained in tools of consciousness that include skills to block negative emotional responses and to discreate the unpleasant emotions that are stirred up. How to do it is beyond the scope of this white paper. Contact me. What we know about the brain gives a clear message to executives, managers, organizations and companies. Encourage the SCARF traits. 1) Treat employees, staff, colleagues, and teams so they feel valued. 2) Treat them so they are certain that whatever they try will be appreciated whether it succeeds or fails. 3) Treat them so they know they can make their own decisions about what to do, how to do it, and when to do it. 4) Make them feel they are valuable members of an organization in which superiors, peers, and people who report to them are friends not rivals. 5) Make sure no-one supervising them plays favorites. Successful executive coaching and successful organization development follow these rules. For example, in his book, “What Got You Here Won’t Get You There”, executive coach Marshall Goldsmith considers 20 types of flaws in interpersonal behavior that damage relations in a company. Let me link these flaws to SCARF categories. I don’t want to minimize the deep and broad analysis Goldsmith gives. I merely want to show that there is common ground between Goldsmith’s approach and Rock’s. and an excessive need to be “me”. and claiming credit you don’t deserve. Patrick Lencioni’s “The Five Dysfunctions of a Team” is about management consulting, “organization development”. Again, my intent is merely to show common ground. I’m not trying to simplify Lencioni’s work. Absence of Trust is the bottom of Lencioni’s pyramid of dysfunctions. Absence of trust includes a lack of a sense of relatedness. and even afraid of each other. They do not feel they are a group of aligned friends. Often, they may be juggling for a sense of status. The absence of trust and its underlying issues – restoring status and relatedness — is the first problem that needs to be solved when using Lencioni’s paradigm. a fear of an open, free-flowing discussion. Why? Because people on the team don’t trust each other. Fear of conflict is an issue of relatedness. and lack certainty about their part in a discussion. and that their status is threatened. if the team’s members sense lack of fairness. or to the results they should be getting. The amygdala and the pre-frontal cortex are on. Much of the rest of the brain is off. They are in fight-or-flight mode. Pay attention to SCARF traits and needs. letting their work gratify them? whose long term consequences prevent effectiveness and productivity?